There are few things in our modern world that feel uncluttered. Your desk on the day that you buy it, the homes in Dwell magazine, and now, iA Writer for the iPad. The word processing app is streamlined in every way possible, creating the kind of focused environment you might just need to become the next Poe, Bronte, or Fitzgerald. Unlike most other apps where you can choose between every option and variety, iA Writer makes minimalism a certain kind of science. 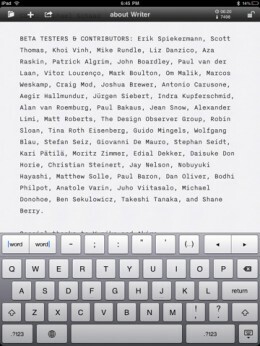 For starters, iA Writer employs a monospaced font called Nitti Light. 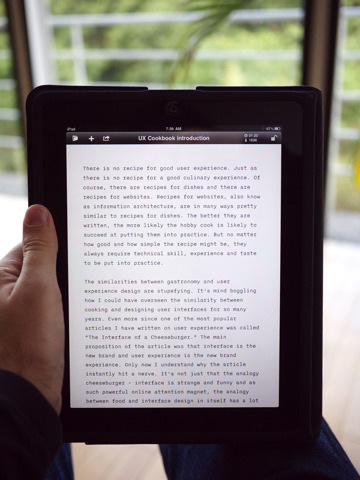 Created and optimized specifically for the iPad, the font is meant to encourage thorough reading and ease of use. Everything else is minimalistic, with features that start and end with a reading and writing time approximation meters, a copy or email text button, a plus sign for creating new documents, and a Dropbox Sync button that lives in the folder where your documents are displayed. 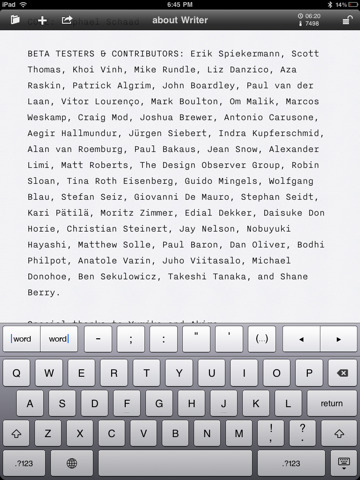 The only other feature in iA Writer is a lock on the upper right hand corner. This button will send you straight into focus mode by scrolling through the document immediately to the cursor and locking on that location. The benefit this button creates is called Focus Mode, and it’s a setting that displays only the three most recent lines of text. Everything else is blurred out, leaving you with a text centric setting that eliminates spell checker, options, and everything else that might distract a writer in typical word processors. 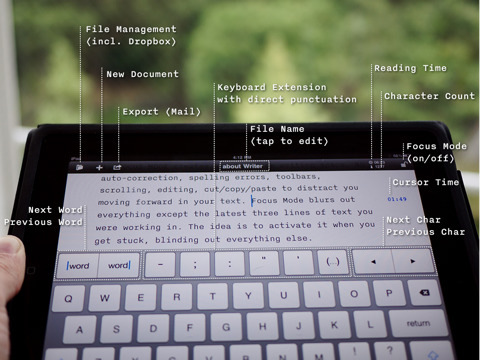 iA Writer also benefits from “keyboard extensions,” an in app keyboard design that adds an extra row of buttons at the top of the iPad’s default keyboard. This row improves on the regular keyboard by including commonly used punctuation marks (dash, semicolon, parenthesis, apostrophe, etc). There’s also a set of buttons that let you either scroll left and right letter by letter or from word to word. It still might prove difficult to type an entire novel on an iPad, but if you’re going to use the iPad keyboard for word processing then this is the keyboard to use. When you’re ready to call it quits with a document everything you’ve been working on automatically saves in a folder on the upper right hand corner of the app. 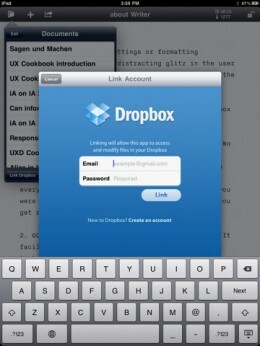 Syncing the other direction by adding documents to my writer folder and then updating my iPad, was unsuccessful. It seems like this syncing component will have to improve in future updates (we are only on version 1.0 after all), but when it comes to overall usability this is a nicely executed writing app. Bottom Line: iA Writer brings science to the world of word processors by creating a text centric, tunnel vision approach where nothing matters more than the words at hand. 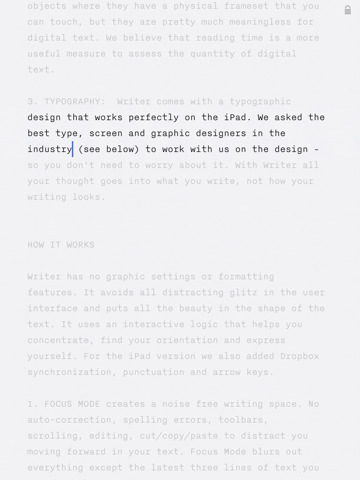 Beautifully done for those who seek a minimalistic writing environment for the iPad.